GARNER – Garner-based Improved Nature has raised more than $3 million, according to an SEC filing. The company offers alternative plant-based meat substitutes made from non-GMO sustainably-sourced plant-based soy proteins. “We believe it’s the small acts which affect the most change in our world,” reads the company’s website. The company currently offers multiple products and is led by president and CEO Richard “Rody” Hawkins. David Swintosky, CFO of Improved Nature, explained at a conference last November the company’s approach and goals. “Alternative proteins are a sustainable alternative to animal meat,” he explained. Improved Nature is a business-to-business company that sells its products to K-12 school systems, hospitals and other bulk buyers. He says the company, which sees a strong demand for its products, has raised $100 million and paved the way for consumer acceptance. “Our goal is to feed the world with high-quality food products,” he said. “We do not blend the ingredients to develop the meat-like texture,” the company states. While many other companies provide products whose ingredients are mixed in a dough-like structure and then further processed, Improved Nature® uses their technology to give healthy soy protein the same consistency of traditional meat. To achieve this, Improved Nature uses a single ingredient (soy) mixed with purified water to form meat-like fibers. 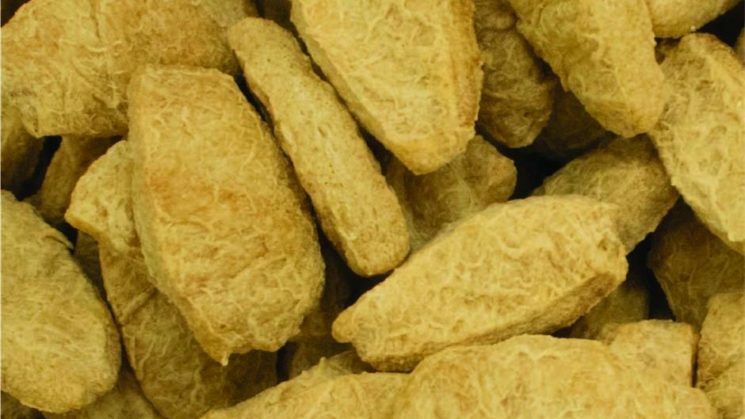 The fibers are shaped into strips, patties, chunks, or nuggets that satisfy the desired consistency of traditional meat. “We guarantee that no other plant based product available comes as close to matching the texture of traditional meat,” states the company. The products can be prepared in refrigerated, frozen, or shelf-stable varieties.